We are offering laser cutting services for military clothing. The most popular material is hypalon. Hypalon is used for vests and other uniform details. Our laser cutting equipment and facilities are well secured. If needed LaserCut Fabric will sign Non Disclosure papers to prevent any concerns regarding security. All material receiving, handling and shipping is done by trained personnel. We are proud to serve number of companies including NASA. We laser cut Hypalon for military vests. 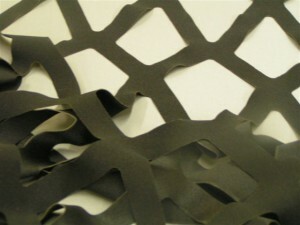 Other materials: Silicone rubber, fabric for uniforms, Neoprene, leather, leatherette, suede, etc.